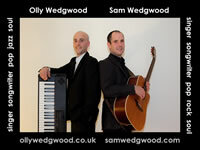 Here's the press release for the £400 cheque presentation, following the concert by Sam Wedgwood & Olly Wedgwood's Band at Red Bar & Restaurant, Weybridge Surrey on 11th November 2010. 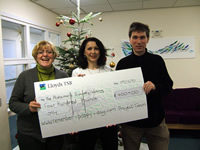 Teresa Scannella and Chris Grace of the Remember Poppy Day project present a cheque for £400 to Joy Valcarcel of the Woking Alzheimer’s Society at the Bradbury Centre, Lavender Road, Woking, Surrey. 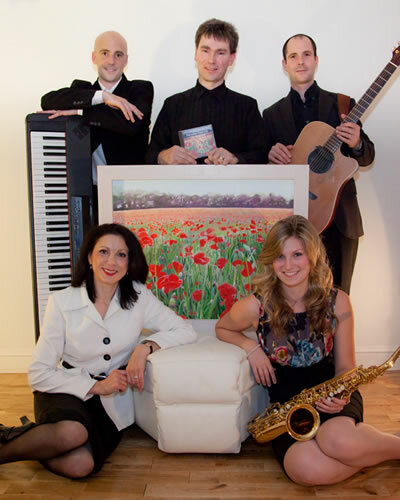 The money was raised during a night of superb music to an audience of 150 by Olly Wedgwood and his band and Sam Wedgwood at Red Bar & Restaurant Weybridge on Remembrance Day. 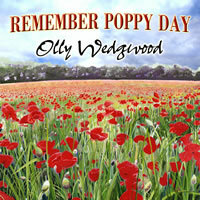 The evening included a performance of the ‘Remember Poppy Day’ single by Olly Wedgwood, which Chris Grace co-wrote with him. A raffle was held, the prizes were a limited edition print of Teresa’s painting, Frank’s Wood - Leith Hill, and a £50 voucher from her place of work, The Body and Beauty Studio, Woking. 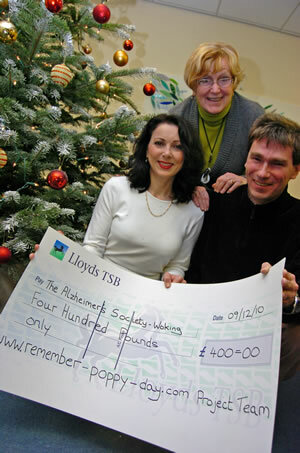 £350 was raised on the night and this was increased to £400 by donations from Teresa’s clients. Teresa’s mother passed away on 9th May this year after suffering with Alzheimer’s for over 20 years. Her picture of Pyrford Poppies has previously raised several hundred pounds for the Alzheimer’s Society so it was particularly poignant to her that her Poppy picture was used for the Remember Poppy Day project where 50% of profits from art sales from the website www.remember-poppy-day.com will go to the Alzheimer’s Society. The single also helped to raise money for the Poppy Appeal.. 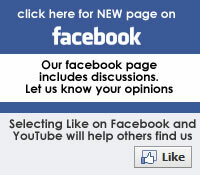 The Remember Poppy Day team would like to thank everyone who made a donation via the www.remember-poppy-day.com website. Further donations can continue to be made. Teresa’s paintings can be viewed on www.surreyartists.co.uk .For limited edition prints contact Teresa direct on 07896 255 017 or by email teresa@surreyartists.co.uk .